Dear Desert, the Dublin-based three-piece made up of Brendan Millar (Futures Apart), Richie Fenton and James O’Donnell (Hush War Cry), first started making a noise in late spring when they revealed their emotive pop debut track ‘Give It Up’, produced by Darragh Nolan of Sacred Animals. They then followed this with ‘Gift Above’, the title track of their upcoming debut EP, which, with its piano chord opening and synths and percussion overlay, augmented by Brendan Millar sealing the six-minute deal at just after 90 seconds in with an achingly gorgeous vocal, you get the impression that here is a band destined to reach far beyond their Irish roots. We caught up with the band to find out a little more. James O’Donnell: Well, broadly speaking it’s Brendan on vocals, Richie on bass and myself on guitar. Richie handles the programmed beats end of things, while we all throw a hand at synthesisers. The writing process is very much a collaborative and experimental effort and we could end up playing anything on record. There are no rules so to speak! Right, after that I am going to get straight to the main question: ‘Supernatural Love’, the track on the new EP – what a song! Please tell us something about this. Brendan Millar: In general the song is about a couple whose relationship is under some extreme external pressure which makes their time together both precious and fleeting, similar to a Romeo and Juliet scenario. The first line “I see your face, an empty space before life starts” comes from the feeling of familiarity when you meet someone you’re destined to fall in love with, and we kind of go from there to introduce the external complications and ultimately the frustrations and inevitable pain at times that comes from being in so deep emotionally. I’m very glad this song struck a chord with you, for us that’s a bit of an objective complete. We love when a song gives us chills or makes us misty-eyed. That’s what this entire thing is about. Who writes your lyrics? Because that song is one that I could not envisage being written from anything less than a very personal point of view…? That last minute of the song, with such rawness of the vocal, that is some emotion! How hard was it for you, Brendan, to both write and to sing that? Can you say who it was you ‘couldn’t save’, and from what? BM: It’s very true that ‘Supernatural Love’ comes from a deep personal perspective and was tough to write, but it might be a tad uncool to name names publicly and go in to specifics, as well as maybe taking away from listeners’ own interpretation and allowing them to apply it to their own life/heartbreak. The final line of the song was indeed difficult to sing, it comes from the feeling of frustration and the constant niggling in someone’s mind after their other half is gone of “Was there something I could have done better or did I do enough”. James has mentioned to me a few times that the studio windows rattled during the recording. What processes create those kind of lyrics? Is it a regimented, structural approach – to both lyrics and music – or something more freeform and organic? Richie Fenton: For us the music informs the vocals and lyrics. Usually the first vocal take captures an emotion or atmosphere specific to that time. The subconscious almost always writes the first draft. There will always be a few of these phrases that stay in the final draft. An interpreted mumble can sometimes end up as the song title! After that Brendan usually brings drafts, and we work through them together until we are happy with them. JOD: That’s the magic with lyrics, personal interpretation! Some of my favourite lyrics in songs are probably ones that are not actually there. I know Michael Stipe of R.E.M and The National’s Matt Berninger purposely make their lyrics on recording so that they are not completely decipherable, and perhaps more universal. It’s an interesting one. You have been described as a band that “wears their heart-on-their-sleeve”. Would that be an apt description would you say? It certainly sounds rather like it to an outsider. BM: We’d say that’s pretty apt since everything we do is geared toward evoking a certain emotion in the listener while working through our own emotions in the song writing process. We are always striving for an honesty, which hopefully is reflected in the music. Honesty plays a big part in our live shows also and we hope we come across as real. We have heard the first two tracks from the EP that you have previously put out, but the other two were a complete surprise. Enlighten us a little more on each of the tracks. ‘Pharoah Vessels’ I was quite interested by, as there feels a slight….what’s the word?….’church-like’ texture in that…? What are – or is – a ‘pharoah vessel’? RF: The church choir texture is interesting, albeit consciously unintentional, but I can definitely see a thread of that ‘texture’ through the EP. I guess all of us were in a choir as kids at some stage and you would like to think the music we make now is a result of our whole lives. I think music sometimes has that cathartic ability to delve into past experiences otherwise lost. JOD: Simply put, a ‘pharaoh vessel’ is a song about death: the fear of it, and the eventual acceptance of it. There is a narrative of thoughts that could pass through your mind in your last moments. This influenced some of the samples that can be heard on it. Throughout history the term crossing the river has been associated with death, here the pharaoh is the modern personification of ancient death. We, like the ancients, must meet that same end. ‘Dear Desert’…I don’t think there are many deserts to be had in Dublin, so how and where from did this name derive? Do I recall rightly that I read that it was inspired by a Charles Lamb poem, ‘The Old Familiar Faces’: ‘Earth seemed a desert I was bound to traverse’? JOD: We all are interested in literature to some degree. In terms of influences, to name a few: Emily Dickinson, T.S. Eliot, Philip Larkin, W.H. Auden. Poetry is a powerful tool, the summing up of a lifetime’s wisdom in a line like that, captures the imagination; the fleetingness and fragility of our existence can make us feel the most significant and insignificant beings all at once. The desert represents desolation and isolation, but there is a beauty in that to hold dear I guess. Richie, you have said before that DD seek a ‘certain human element to the sound and were drawn to imperfections in the recordings’. Can you explain what you mean by this? RF: When recording we often went with a take that wasn’t technically as good but just captured an atmosphere that we liked. Some parts in songs on the EP were recorded on our initial demos but we just couldn’t replicate them with that same feeling again. When something is played by the human hand it is often imperfect. It would be dishonest to try and make everything sound machine-like in delivery. Acting as your own PR, give us a short spin on Dear Desert: the band, the music. 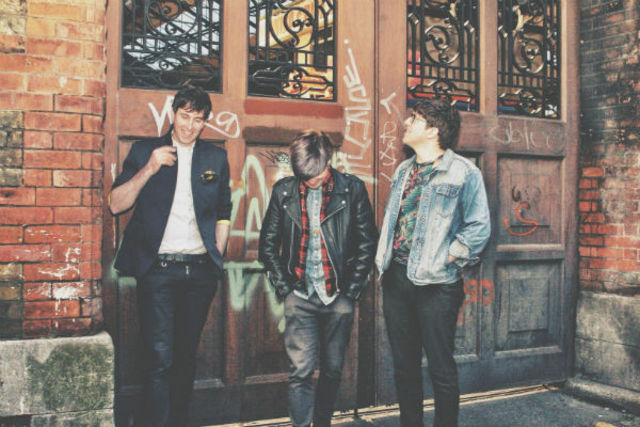 BM: We’ve been described as emotive pop purveyors, which we find sums us up quite nicely. There’s definitely an 80’s pop vibe to our music but this comes to us quite naturally so we embrace it. You’ve all been in other bands before DD, so how did you come to shape this project together? RF: James and myself were in a band together called Hush War Cry, while Brendan was in a band called Futures Apart. We played a few gigs together and we just clicked from the get go. There was always a huge amount of admiration for each other’s bands, so when the opportunity arose to play music together we grabbed it! I understand that two of you were – still are? – architects? Does that bear any influence on how you go about constructing your songs? JF: We still are, yes, – it pays the bills! It is similar in its process, you learn from architecture about process; one thing leads to another, and sometimes a path you think is going nowhere can shed light on a song/design – which you might never have found otherwise. Retaining the magic of your first sketch or draft in the final polished version of the song would be another. You are called a Dublin band – do you all come from there? What is it about Ireland that seems to turn out such musically gifted individuals, do you think? JF: We’re all from different parts of the country. Richie is from Waterford, Brendan from Wexford, and I am from Kerry. We all moved up to Dublin simply because there us more going on up here music-wise and jobs-wise. As for Irish music, I guess there are a few names that pop to mind, but I don’t think the last ten years has been massively fruitful for Irish bands. The last year or two has seen a definite change though; there are a lot of really good bands coming out of Ireland right now. It might be a result of the recession, I dunno, but bands are coming out now that have the belief that their music has longevity and potential outside of Ireland. There is a real confidence in the air, which is nice as it is unusual for Irish people. Who are the musical influences behind DD and how would you say that has impacted in your style and sound? RF: A lot of 80’s bands would be an inspiration to us. Japan would be one we would all agree on. They had a consistency in style and sound which was very individual. More modern bands like Future Islands, Wild Beasts and Yeasayer, and even more recently Sean Nicholas Savage and Conan Mockasin, have been getting a lot of plays in our studio. The most important thing for us is paving our own way as regards sound and style. What plans do the band have both record and gig-wise coming up? Are there any plans afoot to come over to England for some live shows? JF: Well, our EP ‘Gift Above’ should be out by the time this interview goes out so we would encourage people to check that out. We would love to do a show in London sometime soon. After our EP launch gig we are definitely going to look into a mini tour and a stop in the UK is a must. It is very important to us that our music reaches outside of Ireland. You now have a few sentences for your big plug to push whatever you might want to promote. Use it wisely! Go…..
BM: “Gift Above, Gift Above, Gift Above” as James mentioned, we’ve just released our debut 4-track E, so for the next few months we’ll be promoting it though live performances. Keep an eye on our social media sites for gigs in your area and get in touch with us if you’d like to have us play your town. We always like building new relationships with people so if you like us do come up to us after a show and say hi. Last word: spill your word or words of wisdom. Say ‘pass’ if you have none. BM: It may be a bit strange for us to try to pass on any words of wisdom or to try speak from a “knowledgeable” point of view as we are a relatively young band, but maybe that in itself is a piece of advice. Know that there’s no right or wrong way to write music and that all anyone can do is to stay true to themselves. Nobody has all the answers and everyone is right in their own opinion. Try to treat others with respect as much as possible because everyone is human just like you are. Gift Above is out now.